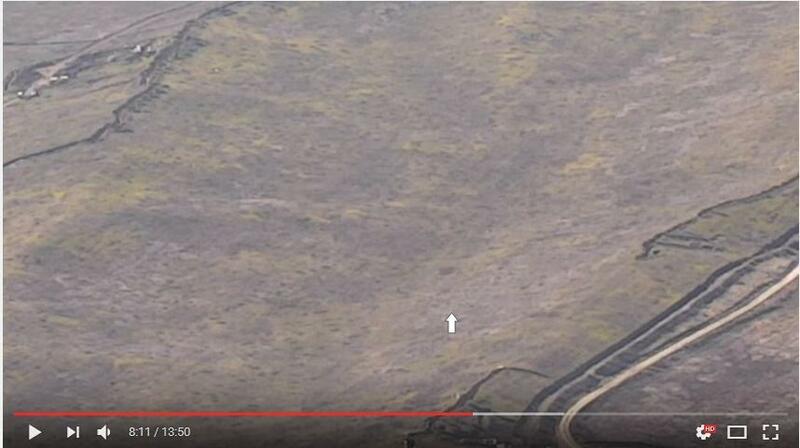 Screenshot of a video posted by Arshak Zakaryan, a videographer who works with the Armenian Ministry of Defense, showing the portion of Haramı Düzü, or "forbidden plain," where 5 Azerbaijani soldiers died on February 25. White arrow points to the location of the bodies between the Azerbaijani (left) and Armenian (right) trenches. At least five Azerbaijani servicemen were killed on February 25 in the worst flare-up of fighting over Nagorno Karabakh since last April. As per usual, the Armenian and Azerbaijani press services published versions of the incident at odds with one another. About 20 minutes later, the web site of Nagorno Karabakh’s armed forces published its statement, claiming that the fighting was a result of Azerbaijani incursions attempted overnight in the eastern and southeastern sections of the LoC and that bodies of some the Azerbaijani servicemen remained in the no-man’s land between the two sides. The Armenian side also claimed a build-up of Azerbaijani armor near the LoC. Shortly after noon, Azerbaijani media published a comment from the former commander of Azerbaijani special forces Colonel Xetai Baxisov suggesting that the fighting began as Armenian forces attacked in the area of Azerbaijani-controlled Nargiz Tepe, several kilometers from the LoC, and north-northeast of the Karabakh Armenian town of Martuni. Later in the afternoon, the Armenian military released another statement with video fragments from thermal vision surveillance equipment, drone-shot images and apparently intercepted Azerbaijani communications. The video showed five silhouettes of bodies left in the no-man’s land and accompanying text identified several of them. One of the officers identified was with an Azerbaijani military unit deployed about 20 kilometers south of Nargiz Tepe. In apparent response, Azerbaijani media published a comment from another retired officer, former army corps commander Colonel Shahir Ramaldanov, who also claimed that the fighting was a result of an Armenian attack and suggested that the Azerbaijani servicemen whose bodies were found in the no-man’s land were part of “mobile posts.” “These soldiers fought heroically,” he added. Around the same time, the Armenian side published what appeared to be the recording of the February 25 clash in its near entirety. Thermal imagery equipment showed eight silhouettes approaching a trench line manned by several other silhouettes. After a brief exchange of fire lasting about two minutes, the group of eight began to take cover and disperse, with five of them falling and remaining on the field. The nighttime video was followed by day-time footage showing the bodies, the area of LoC with Armenian and Azerbaijani trenches, and personnel and vehicles, including at least six military ambulances. While the exact objective of the fighting remains unclear, it came on the eve of Azerbaijan's commemoration of the 25th anniversary of the fall of the Karabakh town of Khojaly, when hundreds of Azerbaijani civilians were killed. Past military activity along the LoC has often coincided with similar memorial dates. For example on January 20, 2015, the 25th anniversary of the “Black January” events in Baku, the Armenian military reported eight incursion attempts, with one of its servicemen killed. Several Azerbaijani attacks were also reported ahead of the centenary of the Armenian genocide commemoration marked on April 24 that year.